Our version is traditional, with a few modern twists thrown in. You'll see the Babes and their rather large and quirky Nanny. Robin Hood has his Merry Men, Little John, Friar Tuck, Will Scarlett and other men in tights with less familiar names! The Sheriff of Nottingham is the evil Uncle who not only takes things out on the children, but tries to force Robin Hood's love, and cousin to King Richard the Lionheart, the beautiful Maid Marion, to marry him. There's lots of action and slapstick with witches, spirits and fairies thrown in. As for the rest of the gang and the happy ending you'll just have to come along and see for yourself! It's worth mentioning that this is the first pantomime from the brain cell of Lizzie Lindsell and, she hopes, not the last! So expect to see new ideas flowing from the script to enhance Thornbury Musical Theatre Group's glowing reputation for delivering entertaining and award winning pantomimes. The story of the Babes in the Wood dates back to the late sixteenth century, and originally was a dismal tale of two orphaned children who end up dying alone in a forest! On their parents death, the babes are left in the care of their wicked uncle, who decides to have them murdered so he can claim their inheritance. He engages two ruffian robbers to take the children deep into the forest to carry out his evil wishes. In some versions the rogues end up bumping each other off instead or just cant go through with it. However, either way, the poor babes are abandoned and perish in the wood, after which they are covered with leaves by friendly robins. But fear not, it is a much cheerier story these days. This unlikely story for a pantomime, was first performed as one at Drury Lane in 1827. In 1867 the story was embellished with the legend of Robin Hood, in order to flesh out the tale and help to make a happy ending. This did the trick because Babes in the Wood has always remained one of the countrys top six pantomimes. To promote our pantomime Babes in the Wood we have produced a professionally filmed and very funny video of Men in Tights. Please click here to view it and share together with the panto details with your friends and family. The panto is from 15th to 18th February 2012, performances 7pm daily and 2pm Friday and Saturday. Tickets from £8 click get tickets above to find out more. Check out the promotional video that we put together for Babes in the Wood! Read more about Men in Tights! Bookings for Babes in the Woods tickets are going strongly, however we wish to offer a family the opportunity to have a very special VIP package. This includes four of the best seats in the house, a pre-show meal at the lovely Blend Café Lounge in Thornbury, show programmes, refreshments and ice creams in the interval, a back stage tour after the show with the opportunity to meet the cast including the Babes, Nanny Nicompoop, Robin Hood and Maid Marion, and finally drinks at the bar. If you are struggling for that last minute Christmas present idea, fear not, you can treat the family or friends by ordering tickets for our panto Babes in the Wood which takes place in the February half term. Our award winning pantomimes are great value. You can get a family ticket for less than the price of one for the Bristol Hippodrome's Peter Pan. Not only that, the ice creams are cheaper and parking is free! As well as great deals for families, we are offering discounts for group bookings. 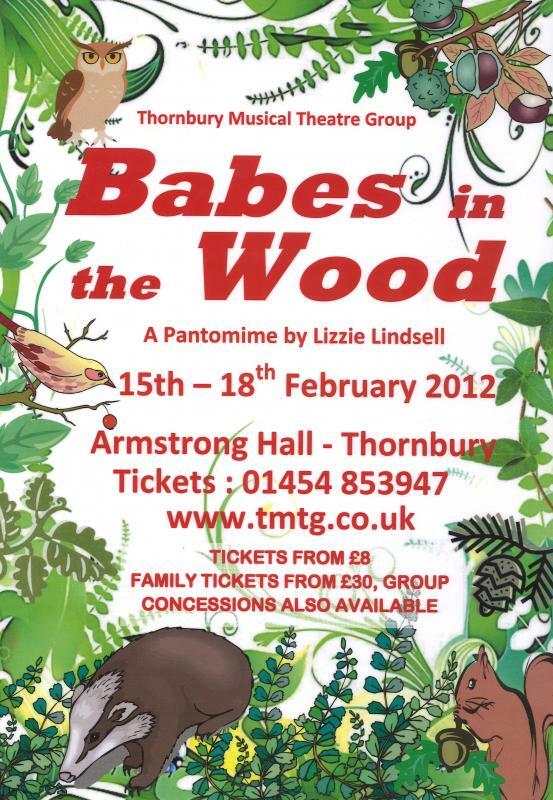 Our next panto Babes in the Wood will take place between 15th and 18th February 2012. We are currently assembling the cast and if you would like a principal part there is a read-through on Mon 31st Oct at 7.30pm at Tytherington Village Hall, with the auditions at the same venue on Weds 2nd Nov at 7.30pm. Auditions will be open (all done collectively), but only auditionees are allowed to be present in the hall. We are delighted to report that our last pantomime ‘Babes in the Wood’, performed in February of this year, has received a Rose Bowl nomination for the Bristol Hippodrome award for best Variety/Revue/Pantomime. This is a fillip for everyone involved in the show but is particularly great news for Lizzie Lindsell who not only directed the show but also wrote the script – her very first one! We will find out if we are successful on Sunday 14th October at the presentations held at the Winter Gardens, Weston-super- Mare. It was clear the company’s reputation for good pantomime production for all ages was renowned. The excitement was palpable in the auditorium. Slapstick with both the mallet/thumbnail/and head and the bench in the schoolroom scenes were well rehearsed and brilliantly timed. Children were ‘in stitches’ over their antics. The final scene was extremely effective and genuinely exciting. Musical playing, good dancing and a touch of slapstick made this a very special moment and was another imaginative touch to an imaginative production, which had lots to offer a very appreciative audience. Lizzie Lindsell had set herself an enormous challenge in making her debut as author and director and had succeeded in giving the audience an entertaining evening. She had some lovely ideas and introduced some modern twists to the story.